It may not be hitting cinemas until the summer of 2016, but Warner Bros. are constantly ramping up anticipation for their huge superhero crossover movie, Batman v. Superman: Dawn of Justice. Last month they released images of Ben Affleck in costume as Batman alongside the newest Batmobile, and now is the turn of Henry Cavill’s Superman. Released via USA Today, the latest publicity image certainly shows a darker tone for the sequel. 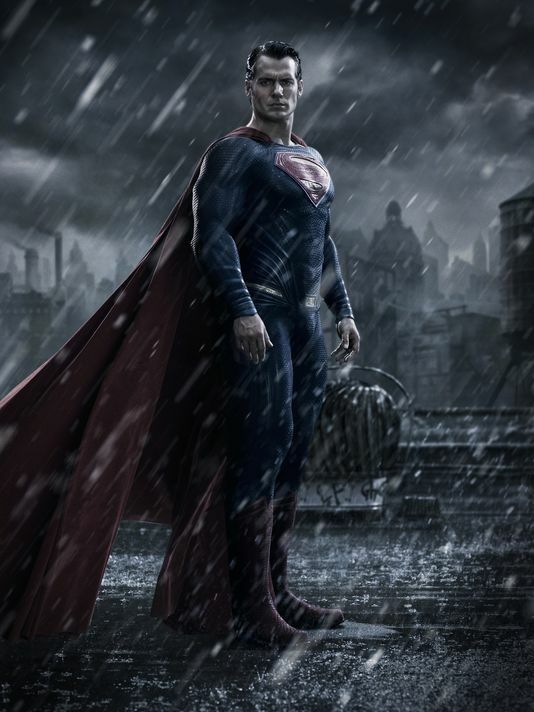 More interesting though is the city behind Supes, which looks strikingly like Gotham. Superman appearing in Gotham would make sense of course, given the close proximity of the two and the fact that Batman is joining the fray. The battle between the two heroes may have been overstated though it seems. Speaking about their relationship the director was tight lipped, “but suffice it to say there is a ‘v’ in between their names [in the movie title].” He said that the choice of ‘v.’ in place of the standard ‘vs.’ was a conscious one “to keep it from being a straight ‘versus’ movie, even in the most subtle way.” Whether that means that the two will team together faster than expected is unknown, but it seems a safe bet. Last week we got the first glimpse of Cavill in costume as Superman’s alter-ego, Clark Kent. He used the opportunity to promote the Royal Marines Charitable Trust by giving them the official release. The charitable organisation supports serving and retired Marines and their families and Cavill is a big supporter of the cause. These images follow last month’s release of the first official images of Ben Affleck in costume as Batman, alongside the Batmobile. ‘Batfleck’ looks decisively reminiscent of Frank Miller’s Dark Knight Returns, something that should please some of the sceptics. Joining Cavill and Affleck are Gal Gadot as Wonder Woman, Jason Mamoa as Aquaman, Jesse Eisenberg as Lex Luthor, Ray Fisher as Cyborg, Jeremy Irons as Bruce Wayne’s loyal butler Alfred Pennyworth, plus returning Man of Steel cast members Amy Adams, Laurence Fishburne and Diane Lane. Batman v. Superman: Dawn of Justice is released on April 29, 2016.